SINGAPORE -- The selfie trend is already big. But Asian teens have found a way to make the actual pictures even bigger. 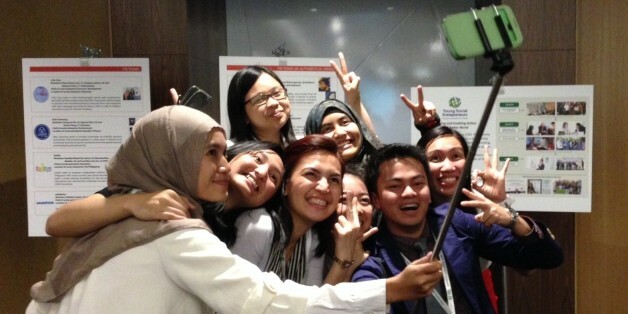 “It’s called a selfie stick,” explains Diana Hemas Sari, a 21-year-old entrepreneur from Indonesia. She’s holding an extendable metal wand that has a blue plastic handle at one end and her white Samsung smartphone clipped to the other. I’ve just watched her use this monopod -- nicknamed the “selfie stick” since she and her friends use it exclusively for selfies -- to lift her phone three feet away in the air, set the camera’s self-timer, then snap a photo of her mugging with her seven closest pals. Gone are the days of blurry, solo self-portraits caught by flip phones in bathroom mirrors. Selfies have become such a social network staple that teens and 20-somethings around southeast Asia, a region that boasts the world’s most active selfie-snappers, have invested in these metal wands to perfect their self-portraits, squeeze more people into the frame and be sure they never miss out on a Facebook-worthy moment. Strange as it looks, pulling out a selfie stick is less awkward than bugging a stranger to take a photo, says Sari. And auto-photographers can take as many pictures as they need to get it right. When the shot is perfected, selfie sticks collapse into the handle and become small and portable. In Indonesia, “it’s become a trend,” explains Sari. Post by SJ Sangguniang Panlungsod Office. The photos Sari has just taken might end up posted to Facebook, Instagram, Twitter or Path -- or some combination of all four. Sari purchased her Gala-brand selfie stick (see below) about a month ago for 200,000 Indonesian rupiahs, or about $18. On Facebook, online stores from the Philippines offer the same models for between 850 and 999 Philippine pesos (or around $19 to $22). Sari and her friends saw Ellen Degeneres’ celebrity-studded self-portait from the Oscars, which thrust group selfies into the spotlight. But next to Sari and her friends, Degeneres was way behind the curve: Hers was taken the old-fashioned way, with a hand clutching a phone. “Actually, we’re so surprised it’s not famous in your place,” says Lestary. Post by Ria Pacu Full.